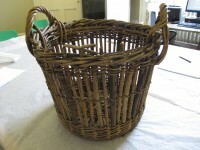 Quarter Cran baskets of were widely used throughout Britain in the herring fishing industry. One cran is the official unit of measurement for herring, and quarter cran baskets were made to exact regulation measurements and had an official brand to certify it they were the correct size. They were used to unload fish from the boat at the same time as measuring the amount of fish caught.